Badminton is currently increasing in popularity in UK; it is in fact already the second most popular participatory sport in the world, second only to football. This is because it is easy to learn; almost anyone can play - whether they're aged eighteen or eighty years old - and because the game can be played at any speed and any skill or fitness level. Most players quickly acquire sufficient skill to hit the shuttlecock across the net and play a rally with a friend. Plus, badminton is one of the few sports where men and women can play together. This makes it extremely social, with couples, families or friends able to play together. However, Badminton is not only good for your social life, it's fat busting, good for your heart, tones your muscles and gets your body and mind into tip top shape, so why wouldn't you play! Don't just listen to us though, celebrities including singers Sting and KT Tunstall, golf ace Nick Faldo and DJ Chris Moyles are all fans of the sport. So whether you're socialising, losing weight or getting fit, give badminton a go! 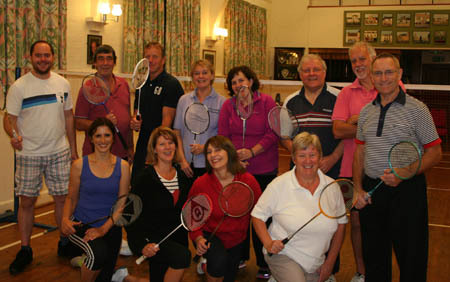 Sidbury Badminton Club is a social, mixed ability club that meets in Sidbury Village Hall every Tuesday night between 7:30 and 9:30pm (and often in the Red Lion Inn afterwards!). If you are interested in joining us contact John Rush tel: 01395 597289 for more details.